Rougepout Beauty: Emma Hardie - Midas Touch Revitalising Eye Serum, my initial thoughts. Emma Hardie - Midas Touch Revitalising Eye Serum, my initial thoughts. Emma Hardie, a name synonymous with amazing result driven skincare and the creator of one of my all time favourite cleansers. As so many of you know I am never without her cleanser in my skincare collection, oh, and the facial oil, don't forget the candles as well. This time the brand has moved from the success of the Midas Touch Face Serum to a revitalising eye serum adding it to the Midas Touch family. Midas Touch Revitalising Eye Serum, my initial thoughts start with the brilliance of the pump dispenser from which the white serum emerges, this gives the perfect amount to use around the orbital bone of both eyes and enough over, to work around the lips, the serum softens down with blending into the most luxurious silky clear light-weight serum, this absorbs leaving a smooth surface. 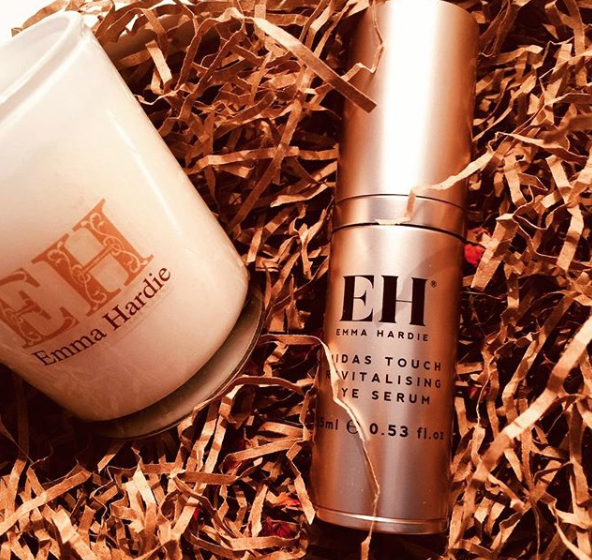 The 15ml eye serum is stored air-tight in a travel-friendly gold cylinder, there are no synthetic colours or fragrances, it is mineral oil free and there are no animal ingredients, the Emma Hardie brand does not test on animals. Using a plethora of high performing ingredients this Midas Touch Eye Serum works at tightening, lifting, diminishing dark circles (hereditary dark circles are just that, you can't remove them, but, a nice product makes everything better), and smoothing the area, it is also ideal to use around the lip area to improve texture. Using what nature has to offer, Emma Hardie includes Beautifeye, this is an extract from the Persian tree of the same name, it literally branches out to deal help with the structure and texture of the skin, Hyaluronic Acid to hydrate, Glycofilm, Sweet Almond Oil - this oil is rich in fatty acids and vitamins it always leaves my skin very soft, Raspberry Seed oil is another fatty acid dream, full of vitamin E and great for keeping skin plumped, of course, 'hello Vera' or Aloe Vera, this is a fabulous product for soothing and cooling the skin a blessing for hayfever ridden eyes. One notable mention as I start my journey with this eye serum, it hasn't created any dry patches below my eyes, this happens with 95% of eye-specific products, so, Emma Hardie is doing me proud already. Keep an eye out (yes, a dreadful pun), my full review of the Emma Hardie Revitalising eye serum will follow in several weeks, great skincare can never be rushed.